Sarasota Bay Watch celebrated its 10th anniversary recently at its annual fundraiser “Scallopalooza . . . It’s Clamtastic!” The occasion brought together friends, partners, sponsors and supporters who share an interest in making the bay better. 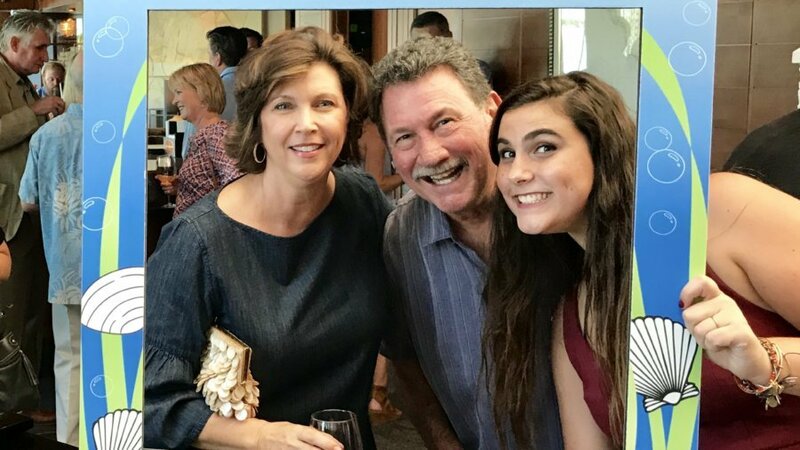 The sold out event at the Sarasota Yacht Club was lots of fun and a great success – and included local sustainably farmed clams for an appetizer! Organizations and partners present included Conservation Foundation of the Gulf Coast, Reef Innovations, Mote Marine Laboratory, Sarasota Police Department, Reef Ball Foundation, Gulf Shellfish Institute, The Chiles Group restaurants, Scuba Quest, Bay Shellfish Company, Two Docks Shellfish, and more. Notables included guest speakers Jon Thaxton, Vice President for Community Investment of the Gulf Coast Community Foundation, who shared fascinating stories of Sarasota’s coastal heritage, and City of Sarasota Sustainability Manager Stevie Freeman-Montes, who spoke about building a sustainable community. START Executive Director Sandy Gilbert helped celebrate our decade of work improving the bay by contributing $3000 as a match challenge to double the impact of donations from attendees. The Gulf Coast Community Foundation and individual donor Peter Powers each added $1000 to the match challenge, bringing the challenge total to $5000. The crowd handily rose to the challenge, helping SBW raise enough funds to support a year’s worth of volunteer events, and continue its scallop and clam restoration programs. Pine View School junior, and SBW student board member, Finn Johnson shared with the audience highlights of SBW’s 10 years of service restoring and protecting the bay. Over the past decade SBW has hosted annual scallop searches, waterway island restorations, and underwater diver-based cleanups, as well as promoted marine habitat creation, developed youth leadership opportunities, and engaged in community outreach. Our scallop restoration program has resulted in over 100 million larvae being released into the bay, and our new clam restoration program currently is growing a quarter of a million southern hard shell clams to help repopulate Sarasota Bay. These are amazing accomplishments for an all volunteer group that depends primarily on many small local donations of expertise, time, materials and funds. The last 10 years prove that seemingly impossible objectives can be achieved when a community pulls together. Join your neighbors in restoring and protecting our precious waterways – go to sarasotabaywatch.org to learn more.